I opened up one of my library books the other day and was bowled over by the smell of stale cigarette smoke. It was so strong it made my eyes water. Besides the occasional stain of dubious origins, this is one of the unfortunate drawbacks of library books: sometimes they stink. Luckily for me, Febreeze works on more than couches and carpets. A few judicious squirts above the offending pages managed to knock out the worst of the stink and make an unreadable library book readable again. Which is a good thing because this particular library book turned out to be a pretty decent read. First lines: Deputy Mattie Lu Cobb liked her new partner. In fact she was quite taken with him...Large, muscular, strong and rugged, he was the only one in the department who could outrun her in a cross-country foot race. In addition to all that, he could sniff out a missing person. He was Timber Creek's new police service dog, a German Shepherd named Robo. What I liked best: Robo! 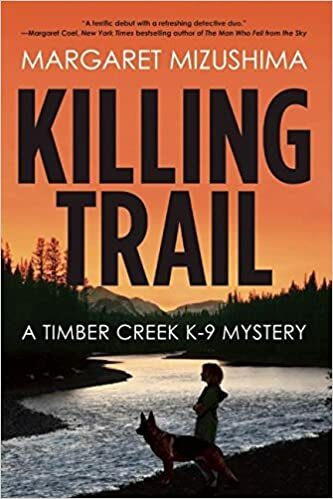 He and his human partner, Mattie, made this small-town murder mystery more interesting and fun. The rest of the book, while good, fell short of amazing for me. Still, I feel like Mizushima has all the necessary ingredients to make this a great series, and I'm very hopeful that she'll be able to better develop the rest of her characters in her next book, and make them as likeable--and her next plot as memorable--as Robo. Because he's awesome. I've missed this one! I've read The Hunting Hour and Stalking Ground, and I adore Robo. He really is awesome! He's what makes me want to read the rest of the series! Haha, love that opening. Sounds like a good book. Too bad you had to deal with the offending odor first but glad Febreeze came through. That is one of the drawbacks of library books. Probably why I try to choose books from the new shelves although that's not a guarantee of a pristine copy either. Yikes! Dubious stains I have encountered before, but never a strong smell of cigarette smoke. But then as a former smoker, my sense of smell is probably pretty shot anyway. Glad you were able to fix the problem for both you and the next reader! Those opening lines are great! Who wouldn't want to keep reading? I bet the first book of any mystery series is tough as the author has to balance world building with the plot and doesn't have the option (as fantasy authors do) of taking 500 pages to do it in! One of my peeves, too! Another solution that works pretty well: seal the book in a large Ziploc bag with a dryer sheet. I don't know how it does this, but it kind of absorbs the noxious odor. I never lend books to my uncle as he smokes when he's reading and they are returned in a dreadful state. He only gets what I've finished with! Yuck, that's why I had to stop with paperbackswap. I'd send out books in great shape and in return I'd get books that were a mess or reeked of smoke. I never even thought to try Fabreeze. Thanks for the tip! Ugh. Cigarette smoke is so pervasive and so nasty. Especially on a BOOK! Glad Febreze worked. I never would have thought of using it on paper. Great life hack, Lark! That happened with me and a new Stephen King book. I went straight back to the library with it. It was horrible. It really ruins a book, doesn't it? I don't run into too many library books that smell of cigarette smoke, luckily, but the times I do...whew! I didn't know if Febreeze would work, or not, but I thought it was worth a try. :D I was careful, however, not to get the pages wet. Ah, the hazards of library books. I love my library, but I've come across books that smell of smoke, books that have food crumbs or coffee stains (or squashed-bug stains, ewww)... I didn't know you could Febreeze a book, though. I'll remember that for the future. Squashed bugs? I haven't run into that yet, thankfully. I am glad you were able to tame that smell so you could enjoy the book, Lark. Robo sounds like a great character. OMG, I didn't think about that! If the smoker also likes the series you may need to stock up on Febreeze! Or put the books on hold so you get them first!